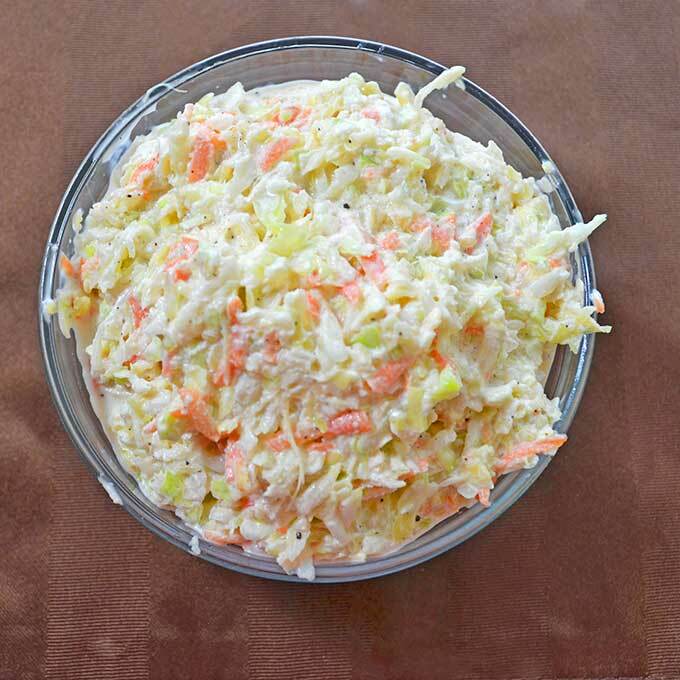 This refreshing buttermilk coleslaw recipe makes a great side to ribs and topping on a variety of sandwiches like hotdogs, burgers and pulled pork. I’m fairly certain that coleslaw is a popular side dish all across the states. Here in the south, though, it sometimes feels like we put it on everything, too. Burgers, hot dogs, pulled pork…you get the idea. 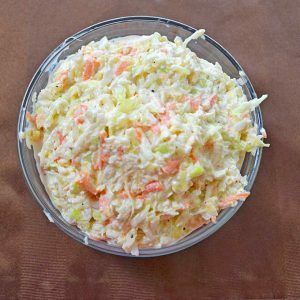 While there are all types of coleslaw recipes out there, I’ve always been partial to this buttermilk coleslaw recipe. Buttermilk gives the coleslaw a lovely creamy consistency, with just a slight hint of tang that I just love in coleslaw. I make this buttermilk coleslaw recipe several times during the summer months as it’s a great side to serve at all the cookouts for burgers, hot dogs, ribs, etc. It’s hard to say no to something cool, crisp and creamy when it feels hot as hades outside after all, right? Coleslaw is super easy to make at home whether you buy the bagged pre-shredded ingredients or do it yourself. We typically have all the ingredients in the fridge, so I just make quick work of all the chopping with my super handy Cuisinart food processor. When you make coleslaw, you do want to make sure you do 2 things. First, make sure you make it far enough in advance to let it sit in the fridge at least a couple hours (or even overnight) to allow all the flavors to marry. Secondly, you want to make sure you don’t add too much dressing to the veggies. It can be tempting to add a lot to make it super creamy, but you’ll honestly just end up with a watery slop after the coleslaw sits a while. You want it to look moist, but not be drowning. After all, if you find it to be a bit too dry after sitting, you can always add a bit more mayo before you serve, but you certainly can’t take it out after you’ve added it. 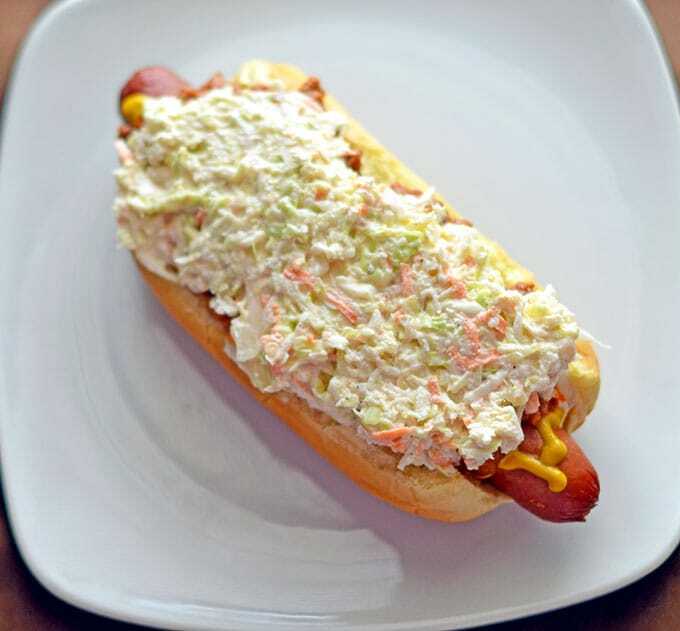 Having grown up in NC, I love Carolina-style hotdogs which is a hotdog topped with chili, slaw, mustar, and onion. I know some of you will wonder if you can use Miracle Whip instead of mayo in this recipe. Honestly, we only like real mayonnaise so I never use the stuff, but it should turn out just fine if you do. This buttermilk coleslaw is creamy and refreshing. In a medium-sized bowl, mix together onion, mayo, buttermilk, sugar, vinegar, salt, pepper and garlic powder, if using, thoroughly. Pour cabbage and carrots (or pre-shredded mix) into large bowl. Pour dressing over cabbage and carrots and mix until well combined. Taste for seasonings and moisture, adding more salt/pepper/garlic or mayonnaise, if needed. Refrigerate for at least 2 hours or until serving. Looking to change things up? Add a bit of spice with cayenne or dose of freshness with chopped fresh herbs or green onion. What’s your favorite dish to serve this Buttermilk Coleslaw Recipe with? Michelle is the founder and blogger behind Smart Savvy Living. She lives in Hampton Roads, Virginia where she enjoys creating recipes, learning how to do things smarter, photography, tech, gardening, and herding cats. She can be reached at [email protected]ng.com.